Added by Jon Godden on 28 January 2010. Hey Jon,both appliances were fitted with blues & twos so both in actual fact were available to attend incidents.Pete. Added by Pete Matten on 29 January 2010. It was not very popular, as most fleet operators had their own liveries - and small companies liked grey, which was much easier to keep clean! Added by Rob Johnson on 27 November 2018. I have a feeling this is actually Coventry Yellow, a fair bit of the West Sussex fleet was painted that colour back then. I'm sure Bob Carver or Pete Matten will confirm. Added by Michael G on 03 December 2018. 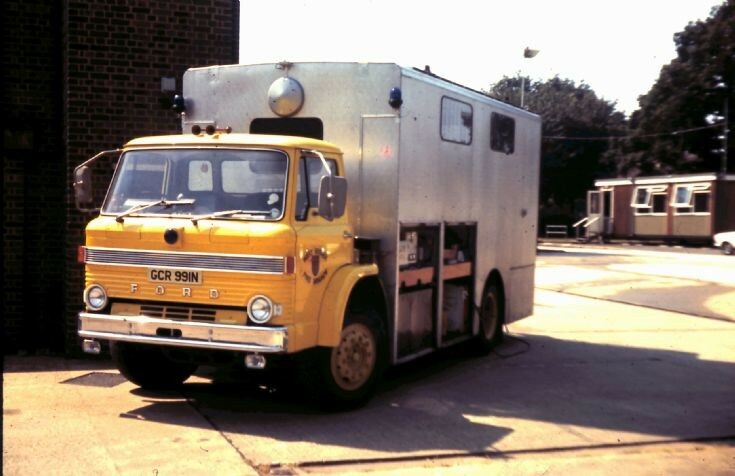 These Ford's were painted Fire Brigade Yellow and numbered five they were built and painted by a Bournemouth based coach builder. In 1980 when they were due for major servicing a decision was then made to return them to red. The vehicle displayed was the only one of the five that had yellow wheels. Added by on 09 December 2018.